Who doesn’t love a big hearty plate of spaghetti?! But the fact it is dense in calories and carbs make it hard to eat it often, which is why I love replacing the pasta with spaghetti squash. As an added bonus, Â my four year old doesn’t just love it; she actually recognizes the squash and requests we buy it at the store! Check out pictures of my spaghetti squash dish below, and scroll to the bottom for the full recipe on Pinterest. The first step is to bake the squash @350Â°F for 30-45 minutes, depending on the size of the squash. Once it’s done baking, you start carving the “spaghetti” out with a fork. Top it off with your favorite sauce and/or meat and dig in! 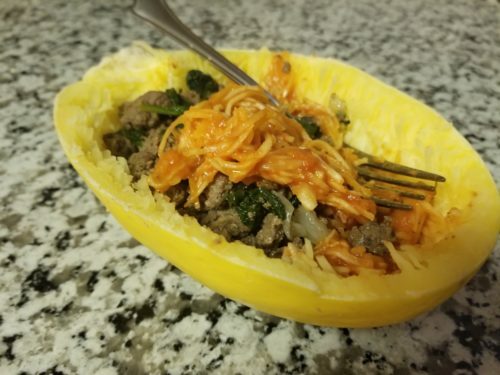 I found an easy to follow and quick to make recipe for spaghetti squash on Pinterest, check it out below. It is the only recipe I’ve tried and recommend if you are looking to make your own. Have you tried this dish before? Do you use a different technique to make it? Share tips and comments below!